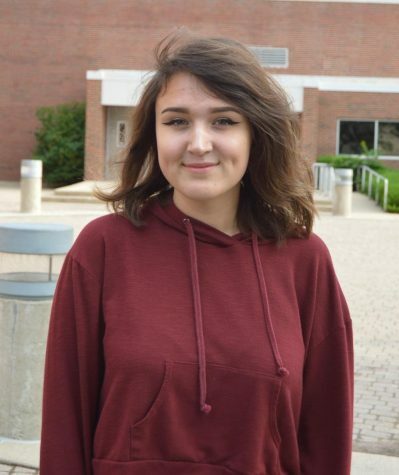 Hi, my name’s Madison Gomez, this is my second year on staff and I'm an entertainment writer and copy chief. Copy chief, by the way, checks to make sure each story is as true and accurate as possible. I want to be a journalist or an elementary school Spanish teacher, but I'll roll with what comes my way. When I was younger, I loved writing stories, but not like the ones I’m doing now. One I remember vividly was about nacho and cheese and how they fell in love, so I’ve gotten more realistic since then. Newspaper has helped me talk to new people, write more and help me figure out what I want to do with my life. I could list my hobbies, but I'm going to spare you, dear reader, of that list. Instead, have this: I like music, books and writing. Now wasn't that short and simple, clear and concise, and right to the point, hopefully like my stories this year.